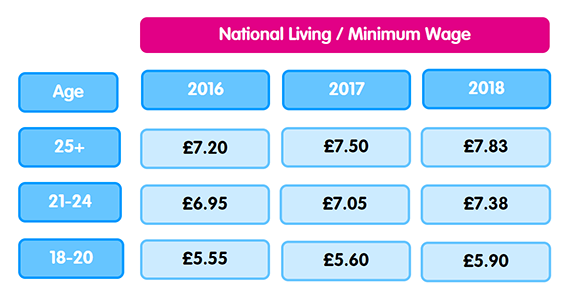 This April saw the National minimum wage rise from £7.50 to £7.85 for 25’s and over, as well as the subsequent rises for the age ranges below that, including the apprenticeship wage rising to £3.70 from £3.50. Coupled with the tax-free allowance increasing to £11,850, not only will the typical taxpayer be paying £1,075 less income tax than 8 years ago, but just as last year have an extra £600 for a full-time worker, this budget increase will benefit those in full-time employment by a further £600. Meaning that, in the past two years, the same job has had its wage increase by £1200. This being a continuation of last year’s budget, as Chancellor, Phillip Hammonds briefcase continues to work to increase wages for U.K. workers. IBP, as ever, remain committed to supporting fair wages, as all staff receive in excess of the living wage. This is down to Managing Director, Craig Roberts belief that all those who work hard, deserve to be rewarded. Craig added, “It’s really good to hear that year on year, not only do the government raise the personal tax allowance, but also the minimum wage itself. It’s important that those who choose to work are rewarded for doing so, as that extra £600 can either mean people can go on holiday, be one step closer to a house deposit, or even just feel slightly more comfortable across the year”. With a continued skills shortage across the job market, and house prices continuing to rise, it’s important that jobs which pay the minimum wage are still able to increase their value to allow people to still have a good standard of life to match the increase in inflation. Whilst we understand there are still more improvements to be made, and the results of this change can only be gauged after being in effect for some time, we are confident that this shows a continued commitment to reaching a minimum wage of £9 by 2020. And as Craig commented last year, people are the most central part of any business, both employees as well as customers and so those involved with success are just as entitled to reward as those at the top.